The KDE Project today announced the immediate release of KOffice 1.2, the third major release of KDE's free, integrated office suite. KOffice utilizes free and open standards for its document formats, component communication and component embedding, and provides a variety of filters to interoperate with other popular office suites. "This new version of KOffice features an incredible number of improvements over KOffice 1.1", explained David Faure, a KOffice developer and release coordinator. "KWord and KPresenter, for instance, provide WYSIWYG on-screen display, bi-directional text editing and spell-checking. KWord has an advanced English thesaurus based on WordNet, mail merge, footnotes and more. KSpread improvements include powerful new database connectivity, sorting and printing options. Kugar has a new report template designer. Filters have improved greatly. Overall, I think users will be very, very pleased with this upgrade." "KOffice has achieved a high level of integration with the rest of KDE and its technologies", added Andreas Pour, Chairman of the KDE League. "With the advanced KDE printing system, users can easily generate high-quality, cross-platform PDF documents. In addition, the file manager Konqueror can now embed a KOffice document viewer for quick browsing, and can also display thumbnail previews of KOffice documents. With KDE's DCOP scripting technology, KOffice documents can be created or edited using scripts or other applications." This release, available in 37 [http://i18n.kde.org/teams/distributed.html] languages, includes a frame-based, full-featured word processor (KWord) [http://www.koffice.org/kword/]; a presentation application (KPresenter) [http://www.koffice.org/kpresenter/]; a spreadsheet application (KSpread) [http://www.koffice.org/kspread/]; a flowchart application (Kivio) [http://www.thekompany.com/projects/kivio/]; and business reporting software (Kugar) [http://www.thekompany.com/projects/kugar/]. Additionally, KOffice includes robust embeddable charts (KChart) [http://www.koffice.org/kchart/] and formulas (KFormula) [http://www.koffice.org/kformula/] as well as a new built-in English thesaurus (KThesaurus) and numerous import and export filters [http://www.koffice.org/filters/] for document exchange with other office suites. The vector-drawing application Karbon14 [http://www.koffice.org/karbon/] is scheduled for its inaugural stable release with KOffice 1.3. KOffice 1.2 complements the release of KDE 3.0.3 [http://www.kde.org/announcements/announce-3.0.3.html] last month. KDE, the leading desktop for Linux and other UNIXes, is an international, powerful and easy-to-use Internet-enabled desktop. KOffice and all its components and requirements (including KDE) are available for free under Open Source licenses. KOffice can be freely downloaded from the KDE http [http://download.kde.org/stable/koffice-1.2/src/] or ftp [http://www.kde.org/ftpmirrors.html] mirrors. KThesaurus. 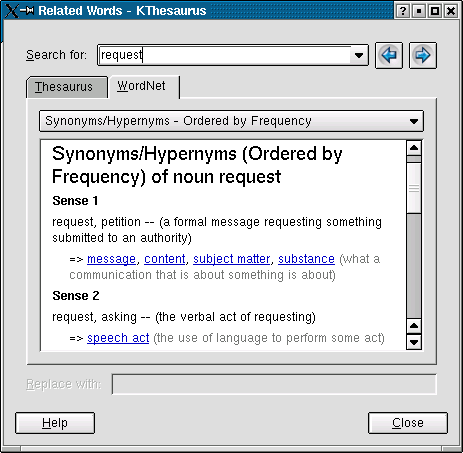 KThesaurus, an English thesaurus based on WordNet, [http://www.cogsci.princeton.edu/~wn/] is a new KOffice component which can also be used on a stand-alone basis (screenshot [http://www.danielnaber.de/tmp/art/thesaurus_screen3.png]). WordNet is a lexical reference system inspired by current psycholinguistic theories of human lexical memory. Thanks to Princeton University [http://www.princeton.edu/] and the WordNet team for their productive research and for making this excellent tool freely available for KOffice and other projects. Konqueror Embedding / Preview. All KOffice components feature a new read-only Konqueror plugin for previewing KOffice documents. In addition, KDE's file manager (Konqueror) can now display thumbnail previews of KOffice documents. DCOP (Remote control). All KOffice components have a greatly enhanced DCOP scriptability. For example, DCOP can be used to insert or reformat text in KWord and KPresenter. Other. WYSIWYG screen display, database connectivity, mail merge, footnotes, sound, template designer, sorting and printing highlights are listed below. All KOffice components are capable of exporting to PDF using KDE's printing system. KWord has a number of new filters for enhanced compatibility with other office suites: WordPerfect (limited import / export); RTF (substantial import); Unicode text (substantial import / export); WML (limited import / export); MSWrite (limited import); PalmDoc (substantial import / export); Lotus AmiPro (limited import); and XSLT (limited support for mapping to other XML-based office formats). KSpread has a new dBASE import filter. Improved filters. KWord has a number of improved filters for enhanced compatibility with other office suites, including new image support for AbiWord, HTML and AbiWord (import / export); RTF (export); LaTeX (import / export); HTML (import / export - the HTML import engine has been completely rewritten); and plain text (import / export). WYSIWYG. KWord, KPresenter and the formula objects have received an overhaul in the presentation: on-screen text layout and painting have been redesigned around the popular and intuitive WYSIWYG (What You See Is What You Get) design concept. Document format. KOffice has switched to zip (instead of tar and gzip) for archiving / compressing its native file format and to using "relative paths" for objects included in the archive (such as images or embedded components). This provides greatly improved document compatability with other Open Source office suites, while enhancing performance. KOffice 1.1 document format support is retained. SVG support. KOffice components can now handle many SVG images (animation is not yet supported). Word completion. KWord and KPresenter offer a word completion feature. By using a key shortcut, these office applications will try to complete the word using a word-list, consisting of the words in the current document or compiled from another document. Spell checking. KPresenter and KSpread now have a spell checker. Mail merge. KWord can create multiple documents from a single template, where only some fields change. The data can come from an SQL database, or can be stored in the document itself. Footnotes. KWord now has footnotes. Configurable footnote (line) separators are included. Tables and frames. KWord has improved tables, including proper table borders, variable-width table sizing, customized table styles and templates, and frames, including inline frame positioning, frame layering, frame styles, adjustable margins and configurable text flow. Text handling. KWord now supports double underline, text shadow, soft hyphens, non-breaking spaces and a text background color, as well as commented text and hyperlinks. Headers / footers. KWord allows different formats for both the first and other pages as well as for the even and odd pages. Image handling. KWord now permits replacing images in a frame and can load KWord 1.0 images. Transition effects. New KPresenter transition effects include Blinds, Box In / Out, Checkboard, Cover, Uncover, Dissolve, Random and others. Moreover, sounds can now be included in transitions. Objects. KPresenter supports several new objects for creating professional presentations have been added: freehand, polyline, quadric bezier curve, cubic bezier curve and convex / concave polygon. New "guide lines" and "guide points" as well as vertical alignment help with object layout. Thumbnail views. KPresenter displays thumbnail views of each page in the sidebar. Styles. Styles have been added to KPresenter for text and paragraph formatting. Comments. A new note bar in KPresenter allows you to add comments to each page of a presentation. Data import / database connectivity. KSpread can load data directly from an SQL database or read data from a text file. Printing. KSpread printing has been greatly enhanced with the capability to define ranges for printing; and to repeat specified rows and columns on each page (for headings and descriptions). Sorting. KSpread can now sort up to three rows or columns together; can store the sorted results somewhere else, to keep the original data intact; and can apply the layout / formatting of the original data to the new location, including adding a row header outside the sort range at the new location. Templates. KSpread now supports templates. Functions. KSpread has 37 new built-in functions, including Euro conversion functions, and now supports "Goal Seek". KSpread function names are now case-insensitive and provide greater compatability with Excel functions. Views. KSpread spreadsheets can now have Multiple views, with each view able to select or modify different portions of the same sheet independently. Sheet layouts. KSpread now allows different header and footer formats, as well as separate layouts, for each separate sheet in a workbook. GUI report template designer. Kugar has a new flexible, WYSIWYG report template designer, which among other things can create, load and save report templates for the report engine and automatically create report bands (such as headers, footers and details). Report engine. Kugar features a new report engine, with support for reports with complicated structures (e.g., master-detail reports) and detail header and footer bands. [http://www.koffice.org/announcements/changelog-1.2.phtml] and notes about the release [http://www.koffice.org/releases/] are available at the KOffice web site [http://www.koffice.org/]. Some Linux / UNIX OS vendors have kindly provided binary packages of KOffice 1.2 for some versions of their distribution, and in other cases community volunteers have done so. Some of these binary packages are available for free download from KDE's http [http://download.kde.org/stable/koffice-1.2/] or ftp [http://www.kde.org/ftpmirrors.html] mirrors. Additional binary packages, as well as updates to the packages now available, may become available over the coming weeks. Please note that the KDE Project makes these packages available from the KDE web site as a convenience to KDE users. The KDE Project is not responsible for these packages as they are provided by third parties - typically, but not always, the distributor of the relevant distribution - using tools, compilers, library versions and quality assurance procedures over which KDE exercises no control. If you cannot find a binary package for your OS, or you are displeased with the quality of binary packages available for your system, please read the KDE Binary Package Policy [http://www.kde.org/packagepolicy.html] and/or contact your OS vendor. The library requirements for a particular binary package vary with the system on which the package was compiled. Please bear in mind that some binary packages may require a newer version of Qt and other libraries than the applicable vendor shipped with the system (e.g., LinuxDistro X.Y may have shipped with Qt 3.0.0 but the packages below may require Qt 3.0.3). For general library requirements for KDE, please see the text at Source Code - Library Requirements [#source_code-library_requirements] below. Updates. Additional or updated binary packages will likely become available over the coming days and weeks; please check the servers [http://download.kde.org/stable/koffice-1.2/] periodically for updates and pre-compiled packages for other distributions. kdelibs 3.0, though kdelibs 3.0.3 is recommended. Both KDE releases can be downloaded following the instructions in the respective press releases (3.0, [http://www.kde.org/announcements/announce-3.0.html#package_locations], 3.0.3 [http://www.kde.org/announcements/announce-3.0.3.html]) at the KDE website. For more information on these kdelibs releases, please see the KDE 3.0 press release [http://www.kde.org/announcements/announce-3.0.html]. Qt 3.0.3, which is available in source code from Trolltech as qt-x11-3.0.3.tar.gz/ [ftp://ftp.trolltech.com/qt/source/qt-x11-3.0.3.tar.gz] and in binary packages from most OS vendors, or later (Qt 3.0.5 is recommended). For reading help pages and other KOffice documentation, libxml2 [http://xmlsoft.org/] = 2.4.9 and libxslt [http://xmlsoft.org/XSLT/] = 1.0.7. Please note that some components of KOffice 1.2 (such as the Quattro Pro import filter and KChart [http://www.koffice.org/kchart/]) will not compile with older versions of gcc/egcs [http://gcc.gnu.org/], such as egcs-1.1.2 or gcc-2.7.2. At a minimum gcc-2.95-* is required. The complete source code for KOffice 1.2 is available for free download via one of the KDE http [http://download.kde.org/stable/koffice-1.2/src/] or ftp [http://www.kde.org/ftpmirrors.html] mirrors. These source packages have been digitally signed with GnuPG [http://www.gnupg.org/] using the David Faure PGP Key (available from the KOffice Signature page [http://www.koffice.org/signature.phtml] or public key servers), and their respective MD5 sums are listed on the KOffice 1.2 Info Page [http://www.koffice.org/releases/1.2-release.phtml]. Further Information. For further instructions on compiling and installing KOffice, please consult the KOffice installation instructions [http://www.koffice.org/install-source.phtml]. For problems with SRPMs, please contact the person listed in the applicable .spec file.